Tom (tom at olpcnews dot com) works as a studio manager for an international broadcasting organisation in the UK, with journalists and broadcasters from all over the world. 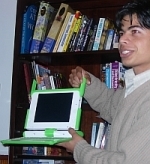 He is interested in the OLPC project as born from his preoccupation with low-cost home computers in his own childhood. He is a regular contributor to the OLPC wiki, but has so far not managed to get his hands on a real laptop, instead having to rely on simulators to see how the project is progressing. Shankar (shankar at olpcnews dot com) is President, One Laptop Per Child Nepal. Its goal is to create an environment for OLPC, take necessary steps to ensure every child in Nepal get the laptops and develop the Local Activities for OLPC laptops that could revolutionize how we educate the children. OLPC Nepal wants to provide every children of Nepal with new opportunities to explore, experiment, and express themselves, and unlike Tom, already has its own B1 Test units. In addition to Jon, David, Thomas, Shankar, and I, OLPC News has occasional guest writers adding their views and opinions to the OLPC debate. We have Robert on OLPC technology, Tom S. on OLPC hacking groups, Christoph on OLPC videos, and coming soon, Toon on OLPC environment impacts. Best of all, OLPC News has you, our vibrant readership which is stimulating the conversation around the Children's Machine XO. Thank you for making this site a lively discussion of all things OLPC. Oh, and don't forget, you can always upgrade and write for OLPC News too! Welcome to the new writers--glad to see you here. I like to think of the XO laptop like the evolution of the motor car. In the early days we had the 8 bit personal computer that closely resembled the first horseless carriages. The Model T Ford of computers arrived in the from of the IBM PC/XT. We developed color displays and GUIs and Windows. Computers kept getting faster and smaller to keep up with demands of users in software requirements. We now have Processors with multiple cores on the same chip. Gigabytes of RAM. Serial ATA drives. Now comes the thinkers. We need a vehicle that is economical to drive and made from community supplied parts. Its rugged and handles nicely on the corners. Most of all its cheap to make. It doesnt need to be fast because we are teaching people to drive. I wonder what vehicle Sabi Roberto drives?